Maia is proud to be a Filipina woman. Born in the Philippines and raised in a traditional family, she combated traditional feminine stereotypes. She often found herself defying the odds and pushing her parents’ and grandparents’ limits as she secretly signed up for sport after sport. The biggest “uh-oh” incident was when she signed up for the wrestling team and was exposed when she made the nightly news. Grandma wasn’t too happy to see little Maia in her singlet wrestling boys. Over time, her parents saw Maia’s will and, eventually, gave in and became Maia’s best supporters. Maia started her career as a middle school teacher. Making History come alive was a challenge Maia took on daily. Years after leaving her class, her kids may not know who said, “Without struggle, there is no progress,” however, they will always remember the value of hard work and integrity and how it impacted them. This kind of attitude she applied easily to her workouts. It’s not just about sweating or doing some jumping jacks… it’s about learning about the depth of the human spirit and how hard one will push to get their goals. Lastly, it’s about the team working towards a shared goal! Six months before Maia’s wedding in 2009, Maia realized that she constantly gave 100% to her job and she forgot herself. It was time for a change starting with losing 25lbs. It was time to put HERSELF first! Plugging into some great programs (P90X and Insanity) and the right kind of support, Maia was able to dance the night away in her best shape ever. Now, it’s her mission to remind people of the importance of taking time for them because they deserve it! Being a mom, a business owner and wife, she understands the demands life can place on us… BUT without taking time for YOU… you can’t give your BEST at work, at home, and to you! 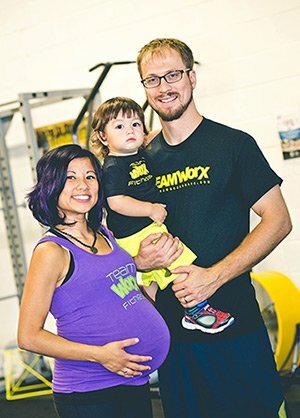 As a P90X Master trainer, Maia pulls from her experience from being a high school and college athlete, a 4 time state champion rugby coach, and a graduate of the top home workout programs such as P90X, Insanity and Brazilian Buttlift. Through her classes, Maia works on her mission to add value to others by creating an environment where people do their best and encourage each other to reach their fullest potential. Three strong beliefs drive Maia. First, she is a WorX in Progress. Her learning never stops. One of her daily disciplines, along with working out, is reading/listening to the great WorX from top leaders: Zig Ziglar, Budda, John Maxwell, Toni Robbins and a fellow friend, Chris Batu. Second, everyone is destined for greatness! Maia’s specialty is believing in you and reminding you of your worth. It’s about getting 1% better each time. Lastly, everything she wants in life will happen if she helps enough people get what they want. Hence, her passion for helping YOU get what YOU want and deserve. Truth is that it took me 2 or so years to get where I am. I’m still worXing on me! Especially after each pregnancy. My drive to be better, to do better, to lead better is YOU – the team (past, present and future)! The power of a team is unimaginable and that’s why I won’t stop pushing for TeamWorX. At the end of the day, it’s not about me. It’s about YOU. Persistence is the difference maker between the “I-Want-My-Results-Now-itis” and those who BUILD DAILY! Build their fitness DAILY. Build their nutrition DAILY. Understanding your worth and purpose makes you persistent. It’s not easy and we aren’t perfect and that’s why you have all of us. Surrounding yourself with others that will push you, remind you of your worth and purpose, and will worX beside you is the KEY! Remember to never stop, never give up and never quit! If all of you could see what I can see… you would already know that if you carry on…. you will get to your results that you all deserve! Interested in being a better teammate – just give a high five, tell someone they can do it, and let them know you beleive in them! Pay it forward and give to others what they need…it will eventually come back to you! I’m living proof of that! Click, Call , or drop in today to find out what The WorX by Maia can do for you!